It’s not uncommon for adults to suffer from strabismus; for some adults it begins during childhood, while other adults develop it well into their adulthood. Strabismus is a condition where the sufferer’s eyes are misaligned, which can sometimes cause debilitating double vision. While strabismus itself isn’t dangerous, because of the double vision, the effects of it can put you in unsafe situations. Luckily, there are various treatment options available to adults that suffer from strabismus. In adults, as well as children, strabismus affects many aspects of daily life. Because of the severity of the double vision associated with strabismus, depth perception is often compromised. This means that adults with strabismus usually can’t drive or work, which can lead to lonesomeness, anti-social characteristics and mental issues. Not only can surgery help to fix the condition itself, but it generally has a positive impact on these social difficulties as well. While it may seem unnecessary, strabismus adults often opt for surgery to fix their condition. Not only is surgery performed in these situations for cosmetic reasons, but also out of medical necessity. Since the surgery is medically substantive, some insurance providers will cover the costs. If you decide not to have surgery there are options that can help improve your symptoms. Sometimes all it takes is either glasses or contacts to notice progress, but generally adults need surgery to be fully functional and able to feel comfortable in today’s society. Doctors can tailor the surgery to fit your specific needs, therefore, you won’t have to endure a more invasive surgery than necessary. If you, or someone you know, suffers from strabismus it should be taken seriously and treated the way you’d treat any other medical diagnosis. Just because it may seem like treatment only fixes the cosmetic problems that accompany strabismus that’s not at all true. 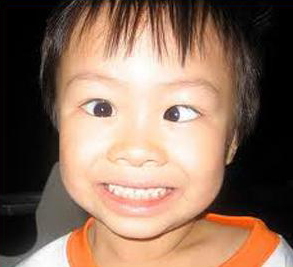 The effects of strabismus can be detrimental to both mental and physical health. If you value your quality of life and have strabismus, you owe it to yourself to look into the many ways that surgery can benefit you. This entry was posted in Advocacy/Cause and tagged eye condition, eye problem, eye problem treatment on July 31, 2013 by Mommy Yam.